Precipitation is moisture that literally falls from clouds in the sky. Precipitation (Latin “to fall from”) occurs when warm wet air rises, cools, and condenses water vapor, forming clouds of moisture. Depending upon the cloud’s height and temperature of the surrounding air, the moisture adheres to dust, pollen and particles in the air to form water droplets which in turn, fall as rain, sleet, hail or snow. Precipitation is a shower for the earth. 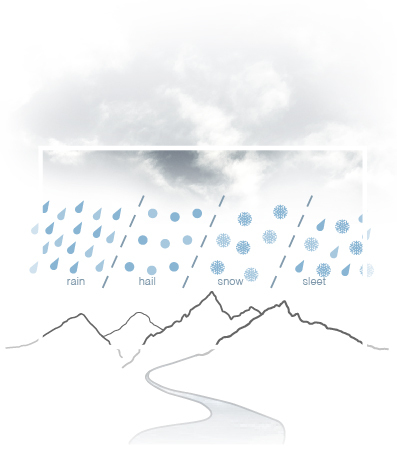 Precipitation is part of the water cycle and is essential for all life on earth. Depending on temperature, weather and air conditions, only about 30% of precipitation falls to the earth, whether hot, cold or freezing, to fill our streams, rivers, lakes and oceans! Some places in the world get less than 0.1 inch of precipitation a year and some get 400+ inches of precipitation. Take a rain shower….out of doors! Take a sled ride on the snow! Draw a raindrop. What shape did you draw? You probably drew a tear-shaped drop of water. It may come as a surprise but raindrops actually come in different shapes and sizes. Raindrops less than 1 millimeter are actually round! As they grow larger they begin to be shaped rather like a droopy hamburger bun (see image). Approaching 4.5 mm they start to distort into a parachute shape with a water-filled tube at the base. Surface tension and air pressure work against each other as gravity pulls the raindrop downwards. 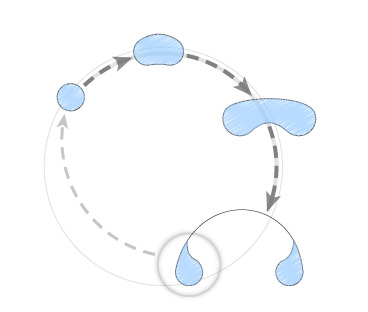 Finally, as the parachute becomes too large, it breaks up again into smaller raindrops and the sequence repeats itself until the drops splash onto something in the natural or built environment. 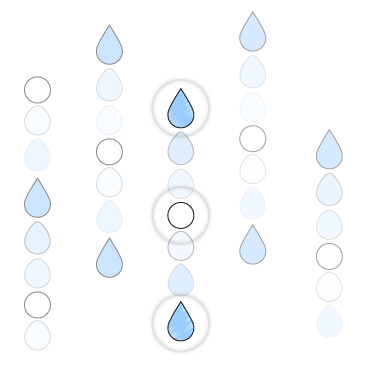 Record the different rain drop shapes and sizes in your journal. Raindrops can become caught in up and down drafts within clouds. Violent sinking and rising air moves raindrops up and down. Different parts of clouds can be different temperatures, causing raindrops to freeze, melt and freeze again. Sleet is a mixture of ice crystals and rain. Sleet falling to the earth can melt and freeze as it falls, forming a slushy, slippery surface. More deadly is freezing rain that shoots to the earth, melts and then refreezes quickly as it hits supercool air near the surface, covering everything with a sheet of ice. This layer of ice freezes surfaces of bridges, covers windshields and makes driving hazardous. In addition, freezing ice covers tree branches and bushes and can cause the collapse and breakage of power lines and power grids. Hail is formed when layers of ice coat minute airborne particles and become hard, rounded pellets. Hail pellets range from 1 to 5 cm although golf ball and tennis ball sizes can sometimes cause a great deal of damage. Hail pellets become too heavy to be supported within the cloud, and are thrown to the ground. Diagram freezing rain, sleet and hail and make a list of safety precautions for each. When snow falls the world becomes quieter. Very small temperature differences define the difference between rain and snow. A snowflake forms when very cold water drops freeze onto dust particles. This creates an ice crystal. Falling down in the sky, water vapor continues to freeze onto the original crystal forming the six sided snowflake. Look at Snowflake Bentley’s Snowflake Photos to see that in fact, every snow flake IS different! The temperature at which the crystal forms is more important than the humidity in determining snowflake patterns. Longer needle like crystals form at 23 degrees F and flat, plate like snowflakes form at 5 degrees F. The atmospheric conditions during the crystals fall. Look closely at the different crystal arms. 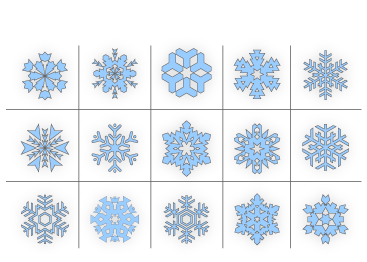 Draw five different shapes and sizes of snowflakes in your journal. Precipitation delivers groundwater. What is not evaporated, run off, or absorbed by plants and animals, filters deep down into the ground into underground aquifers. Aquifers are underground areas of porous rock through which water is filtered. Ground water may flow as quickly as 50 feet per year or as slowly as 50 feet per century! In areas where surface water is not available, people drill into underground aquifers for water. If the water is not replenished by precipitation, or is polluted by ground water sources such as industry, agricultural fertilizers, urban run off, road de-icing chemicals or pesticides, a community’s water resources will be stressed. Research different types of aquifers as part of the water cycle and draw a section through a typical one. Clouds form and constantly change in response to temperature, air movement and air quality. Different parts of the world receive more rain than others. Did you know that 1 inch of rain falling on an acre can leave us with 325,900 gallons? Create a world map that shows annual precipitation by coloring different regions different shades of blue; use the darkest shades of blue for the regions that receive the most rain. Be sure to include a north arrow, scale and key. Next research water shortage. 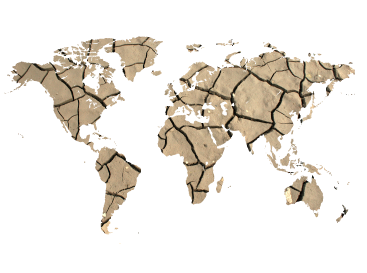 Create a map that shows regions of the world that are expected to have water shortages in 2050. What do you think should be done now to assist those regions? Which delivers more water: 1" of rain or 1" of snow? Which areas are predicted to have water stress by 2050? Aprroimately how many gallons of water does 1" of rain falling on 1 acre produce? What percentage of precipitation reaches the ground to fill streams, rivers, lakes, aquifers and the oceans?